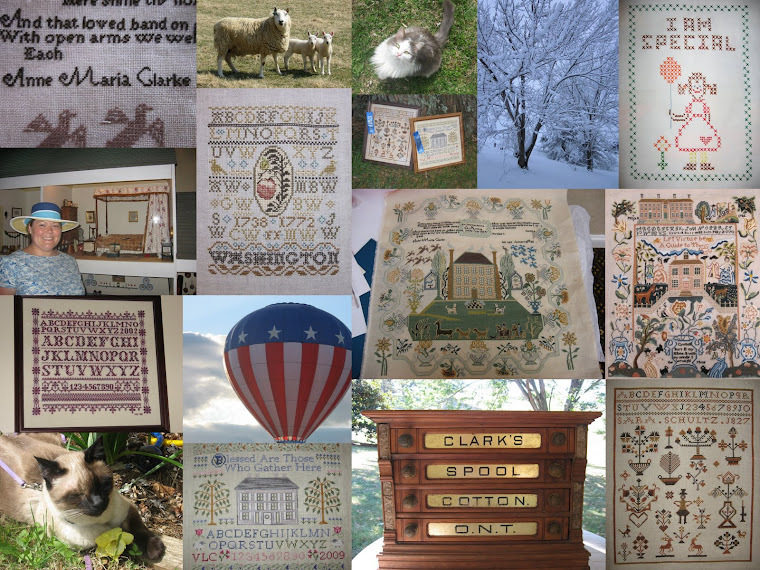 A Shenandoah Sampler: Pictures and a Giveaway! Hello all! It is sunny here in the Shenandoah today...but the snow is a comin'! Apparently on Friday...guess we will see! I did not get called in this morning so I have been catching up on here and getting some schoolwork done. Then...stitching! First I want to share with you a giveaway on a fellow blogger's site. Sharlotte from the happy needle is celebrating her 100th post by giving away the most ADORABLE strawberry emery. It is from Blackbird Designs. So head on over, visit Sharlotte and enter the drawing. I am sure that you will enjoy the trip! Now, I realize that these pictures date back to December but I finally downloaded the from the camera and was just amazed at some of them. I wanted to share with you a few pics from the Blizzard of 2009. We got about two feet of snow during that storm (in Virginia, no less!) and the pics were taken the day after the storm hit. You can really see how deep the snow was here! Thanks for stopping by today. I am finishing up Sara Schultz this week so I hope to have her pics for you soon! Happy Stitching! Looking forward to seeing you post Sara as a finish! Enjoyed the pictures of all that snow you had. Hope that whatever is heading your way in the next few days isn't too bad. Thanks for visiting my blog ! Ya'll are having awful weather, Blizzard, flooding and now Snow again... You might want to move south... lol maybe not. We are to have ice this weekend. Hope you don't get too much more snow! I love looking at the snow pics but I sure am glad that we haven't really had any snow so far this year! I love your pictures, the snow looks so beautiful. Almost makes me wish we had snow here. Almost.